If you are looking for a bargain break, head to the special offers section, where you'll find great deals on mobile home and touring and camping holidays and short breaks. You'll even find grerat deals during school holidays, enabling you to give the family a holiday that won't break the bank. Where do I use my BreakFree Holidays voucher code? With BreakFree Holidays, your holidays are suited to your budget. It doesn’t matter whether you’re after a caravan escape or a stay in a luxury chalet, lodge or apartment, BreakFree Holidays has a wide selection of available accommodation to suit your needs. What’s more, with over 40 years experience in the European Holiday trade, you can be rest-assured that you’re getting the best deal possible. Star browsing online now and begin planning your next break away whether it's a family retreat a romantic getaway or a vacation with friends; there is something to suit everybody's requirements. 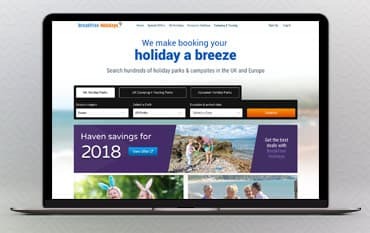 At BreakFree Holidays, you will find a fabulous selection of UK Holidays, European Holidays, Camping and Touring Holidays plus a variety of different accommodation types available to book in just a few clicks. There are over 400 locations on offer with bargain breaks in England, Scotland, Wales, Holland, Belgium, Spain and Italy. BreakFree Holidays work with many well known UK holiday brands to bring you the best holidays and affordable prices. With over 40 years experience in selling holidays around the UK and Europe, BreakFree Holidays is a company that you can trust. As BreakFree Holidays trade solely online, this enables them to keep the costs low and pass savings onto their valued customers. If you are looking for a UK camping break, holiday chalet in Europe or a caravan holiday on a Haven campsite - BreakFree Holidays can cater for it all. With special offers available all year round and online savings to take advantage of to keep your holiday booking cost low, then check out BreakFree Holidays today - you won't be disappointed! BreakFree Holidays makes booking a camping, caravan or chalet holiday around the UK or Europe stress-free and affordable. Simply decide on where you would like to go, for how long and the accommodation that best suits your needs and budget. Follow the simple booking process with BreakFree Holidays, add on any extras such as cot hire and if you would like to bring a pet, pay your deposit or your holiday in full and job done - you have an amazing holiday booked and ready to look forward to. BreakFree Holidays do not include insurance, but they highly recommend you take a travel insurance policy out. You can find some cheap travel insurance companies on NetVoucherCodes.co.uk within the insurance section. With over 40 years experience in the holiday booking arena, you are safe in the knowledge that by booking your holiday with BreakFree - you will get top service and with their price promise, you know you are getting the best price available. Your exclusive 'Booking Reference Number' can be found on the confirmation email that's sent you at the time of booking. If you cannot find your reference number please contact BreakFree Holidays. Do I have to pay for babies/toddlers? Yes. BreakFree Holidays Travel Insurance is provided by Global Travel Insurance Services Limited. Find more information about it here. BreakFree Holidays specialise in offering self-catering trips around the UK and Europe which suit everybody's budget and have been doing so for over 40 years. Operating out of Hemel Hempstead, the BreakFree team are on hand to match eager holidaymakers up with bargain breaks in over 400 locations. Visit this trustworthy online service and you’ll be able to choose great value self-catered holidays from locations in England, Wales, Scotland, Holland, France, Belgium, Italy and Spain. Shop with one of the money-saving Voucher Codes listed on our BreakFree Holidays deals page right here at NetVoucherCodes, and you could help bring that already affordable price down even more! What better way to enjoy your holiday knowing you saved cash online. We are constantly on the hunt for Voucher Codes for BreakFree Holidays to help you with your money saving. Our experts check dozens of sites for secret codes including NHS discounts, student sites & social media channels saving you time & money!